Permanent exhibition in the former music hall & cinema London Pavilion at Piccadilly Circus (later became Ripley’s Believe It Or Not), run by the Tussauds Group. The theatre / cinema had been sitting empty and run-down until in 1986 it was gutted internally and restored externally. From the 2001 Rock Circus website: “The London Pavilion, where Madame Tussaud’s Rock Circus is now located, was once home to a famous cinema and the venue for many star studded premieres. 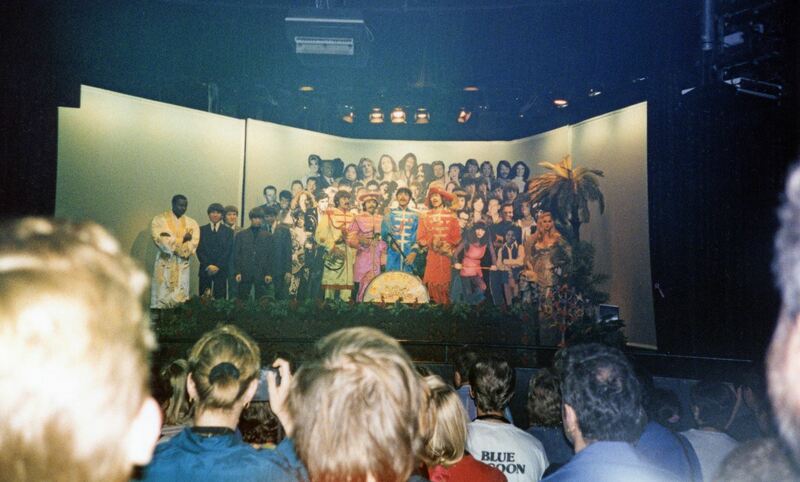 The Beatles made their last public appearance there at the 1968 premiere of ‘Yellow Submarine’. From initial sitting to final figure, it takes around six months to make a Rock Circus figure and costs around £30,000. The animatronic figures featured in the Rock Circus show can take anything up to a year to create at a cost of £100,000. Over 200 precise measurements of every feature of a subject are needed to give the Rock Circus sculptors all the information they need to create true to life models. Most of the stars supply clothes for their figures. Newest addition, Jay Kay donated his trademark hat, whilst Pulp frontman, Jarvis Cocker, supplied his figure’s trendy black cord flares and Pierre Cardin shirt. Janet Jackson and Gloria Estefan both contributed tour costumes from “Rhythm Nation” and “Cut Both Ways” respectively. Real human hair is used in the making of all Rock Circus portraits, including beards, eyebrows and chest-hair! All the figures get a regular wash and brush up to make sure they stay in tip-top shape. One of the hairiest figures in the exhibition is Lenny Kravitz with his trademark dreads. 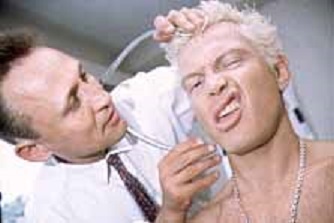 It took one of Rock Circus’ most patient hair and colour artists around 500 hours to recreate one of rock’s coolest hair-do’s – that’s the equivalent of working round the clock for a month! Some of the stars get into musical mode whilst modelling for their figures. Aretha Franklin got into the mood by singing Respect whilst Eric Clapton played Layla for over half an hour to ensure the sculptor could get the finger holds right! Rock Circus doubles, including The Beatles, Sting and Bono made their rock video debut in U2’s rock promo for their hit, “Better Than The Real Thing”. There are 23 guitars – including a left-handed stratocaster, Fender Jazz Bass, three pianos and two original 1950s jukeboxes in the exhibition. Their combined value is a cool million pounds. Tina Turner’s double has been modelled so accurately you’ll see some scrawled writing on her left hand; she scribbles her playlist there to make sure she doesn’t forget what comes next! On a busy day, the attraction received 3900 visitors. Visitors wore infra-red stereo headphones to receive a high-quality soundtrack relevant to the exhibit (or section) they were near. The new Rock Circus takes you behind the scenes, revealing the heart and soul of the London music business, the world centre of Rock’n’Roll. Your tour begins with a tribute to the multi-talented Jackson family, with special focus on the amazing and ever youthful Michael Jackon and his sister Janet. By special invitation meet the stars at a pre-concert V.I.P. party. Rub shoulders with stars like Elvis and Bono. The home of Rock Circus, the famous London Pavillion building has been recreated as it was in its 60s heyday , when it hosted the world premieres of The Beatles’ films ‘A Hard Days Night’ and ‘Yellow Submarine’. Get in vogue at a Madonna video shoot and chart the many faces of the Queen of pop, from ‘Material Girl’ to the ‘ray of light’ she is today. The original specification for the attraction involved a multi-zone speaker system, which John Leonard designed, but this was replaced by the infra-red headphone system once this was demonstrated to the Tussauds Group staff managing the project. Due to various technical and operational difficulties (including headphones being stolen by visitors being evacuated due to security alerts), the speaker system was reinstated temporarily until the issues were resolved. The headphones were reinstated. 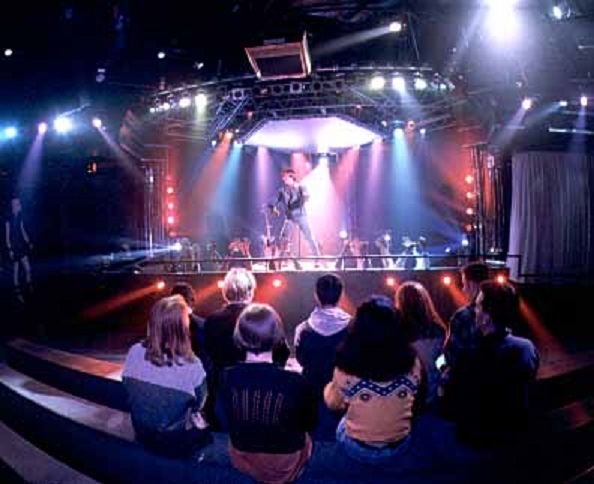 Later in the attractions’ lifespan, a sound system was designed by John Leonard for the animatronic finale in the rotating theatre (see below). The audience sat in an auditorium on benches in front of a curtained-off stage. The lights dimmed and the curtains opened to reveal multimedia and animatronic ‘wax’ figures, including Janis Joplin, The Beatles, Bruce Springsteen, Madonna and The Eurythmics. The auditorium was on a revolve to reveal the other two stages featured in the show. For the time, it was a hugely impressive feat, with a large basement level containing pneumatic and hydraulic systems. Most of the animatronics were built onto platform lifts which tracked into position in pits before being lifted into view. This enabled easy maintenance access, but was very complex engineering, requiring a good deal of care. The pneumatically-operated figures had not been seen in the UK before, and although Disney animatronics had been operational for many years by this point, it was still a sufficient draw to great a large number of visitors. 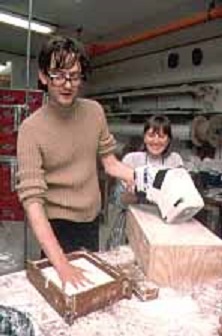 Each animatronic character cost around £100,000 – £150,000 to build, and all were made in Tussaud Group workshops in north London. 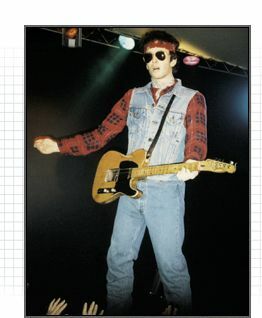 Some movement had been introduced to figures in the main Madame Tussauds exhibition, but the scale of the requirement here was massive in comparison. The show venue, at the top of the London Pavilion building, was Europe’s largest revolving auditorium at the time. 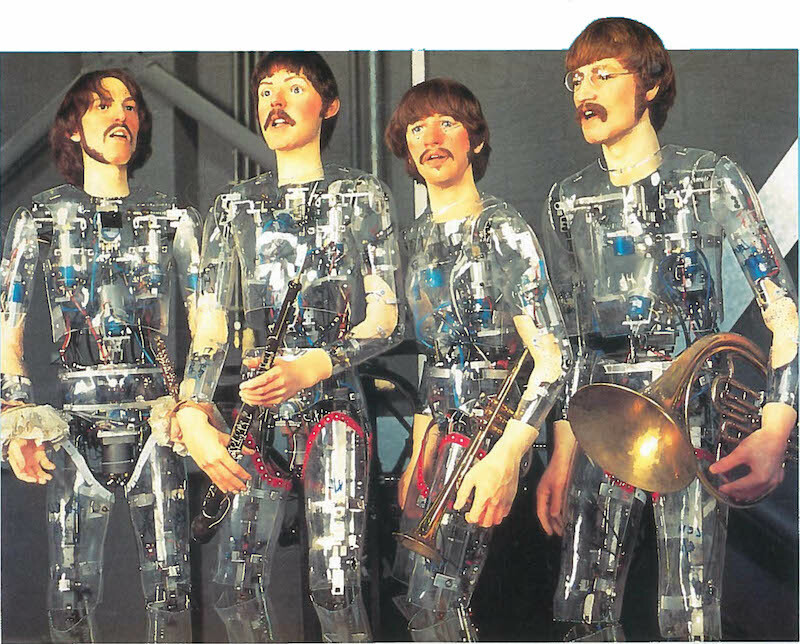 The control systems and audio playback interfaces were built by Electrosonic.Three dedicated computer systems were used, to control the animatronics, sound output, lighting and stage elevation. The data was stored on optical disk systems. 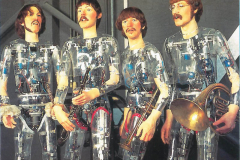 The pneumatic animatronics ran on 130psi air pressure from a large central compressor. 1995 – 2001 – A new £500,000 production based on the 100 year ‘History of Rock Music’ replaced the previous finale. At the start, headphones were used in the finale show, but when the show was refurbished, a PA system was installed to increase the immersive feeling and more ‘live concert’ feeling. In 2001, Rock Circus was closed, and plans were submitted to convert the 2nd – 5th floors of the London Pavilion, previously occupied by Rock Circus, into a health & fitness centre.